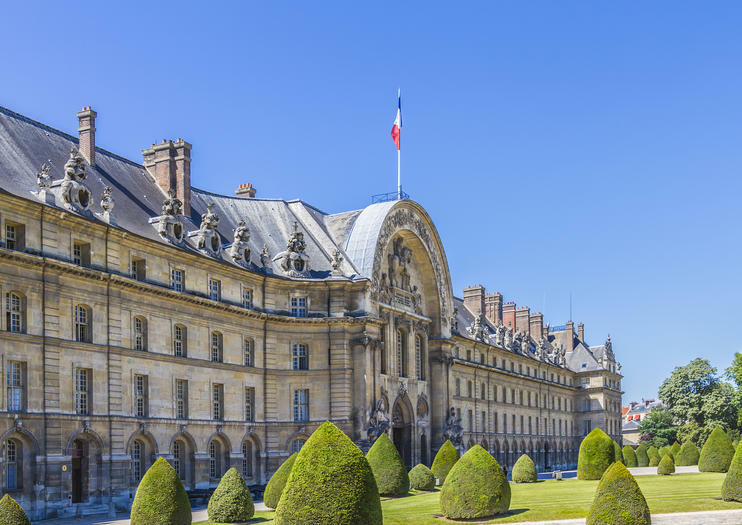 Built under the orders of Louis XIV beginning in 1670, Les Invalides—formally known as the Hôtel National des Invalides—was created as a hospital and care facility for wounded war veterans. Today, the site still serves that purpose, though the sprawling complex also comprises several museums, numerous courtyards, and Paris’ tallest dome. Located in the seventh arrondissement, Les Invalides is one of Paris’ most recognizable landmarks, and welcomes millions of visitors each year. In addition to its practical functions, the complex also contains three museums: the Musée de l’Armée (one of the world’s biggest collections dedicated to military history and art), the Musée des Plans-Reliefs (which contains historical models of fortified cities), and the Musée de l’Ordre de la Libération (a small museum that explores the French Resistance during World War II). The jewel of Les Invalides is the Dôme des Invalides, which was inspired by St. Peter’s Basilica in Rome. Considered a masterpiece of French Baroque architecture, the church’s gilded dome is, at 351 feet (107 meters) high, the loftiest in Paris. Within, the church houses the tombs of notable figures—most famously that of Napoleon Bonaparte. For those looking to explore further, Les Invalides is a frequent stop on hop-on hop-off bus tours; walking tour itineraries, meanwhile, make it simpler to navigate the enormous site, and also frequently include skip-the-line privileges. A Les Invalides ticket includes entry to the Dôme (and the Tomb of Napoleon), the Saint-Louis Cathedral, the Charles de Gaulle Monument, and all three museums. In addition to its permanent collection, the Musée de l’Armée also hosts temporary exhibitions. Les Invalides is a popular destination for architecture lovers and history buffs, particularly those who are fascinated by military history. Visitors can take Métro lines 8 or 13, or the RER C, to the Invalides stop. Les Invalides is also easily accessible on foot from other nearby attractions, including the Louvre and Musée d’Orsay. The Invalides complex is open daily from 7am–7:30pm (except on Tuesdays from April–September, when it closes at 9pm). Individual museums and on-site attractions have a range of visiting hours (and holiday closures), so be sure to research opening times in advance. Les Invalides also hosts and participates in a number of events throughout the year, including the International Automobile Festival, Nuit Blanche, Night at Les Invalides, concerts and film screenings, and more. Les Invalides played an important role in the French Revolution: a mob stormed the site and took thousands of weapons, including guns and cannons, before continuing onward to the Bastille.